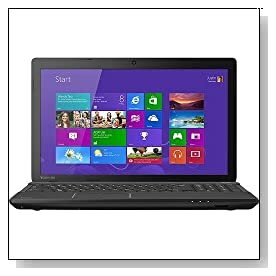 Toshiba is a popular brand for trusted and affordable notebook computers and Satellite C55-A5302 is certainly one of them.. 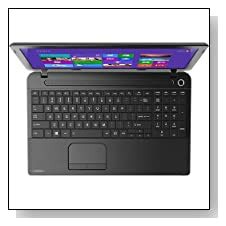 It is a 15.6 inch laptop with a one year old Pentium 2020M processor, 6GB RAM and 500GB hard drive, offering satisfactory overall performance, efficient multitasking and adequate space for storage. These are not the very best core specs but you will also not be spending a lot to get this laptop. Software like Adobe Photoshop, Dreamweaver and Illustrator will work problem free, you'll be alright with most game titles even though it is not a strong gaming laptop- You won't have much luck with games like Skyrim but will be good with Minecraft. 15.6 inch LED-backlit TFT HD widescreen display with TruBrite and 1366 x 768 pixel resolution and Intel HD graphics card with shared video memory provides rather sharp images, however it is not a touchscreen to use with the 64 bit version of the Windows 8 operating system. The sound quality is sufficient but not the best- probably as good as you can get with a budget laptop. Trax Horizon finish in satin black Toshiba Satellite weighs 5.4 pounds and is 1.40 inch thick- both about the average for a 15.6 inch laptop and it is portable enough. It has a 6-cell battery that gives you around 4 hours in normal use, which is not to brag about. Keyboard is standard with a 10 key numeric keypad for easy data entry. You have the built in speedy WLAN 802.11b/g/n wireless with solid range and respectable signal strength, a 10/100 Ethernet LAN with RJ-45 connector for easy wired connection, a multiformat DVD±RW/CD-RW with double-layer support , a HD Webcam with microphone, an HDMI port to connect to larger screens, multiformat media reader, a USB 3.0 port for quick data transfers, 2 x USB 2.0 ports, no Bluetooth but you can buy a cheap USB adapter. Conclusion: For how much you're paying, Toshiba Satellite C55-A5302 is a reasonable performing notebook for everyday computing stuff like surfing the net, word processing and spreadsheets, uni projects, home entertainment- watching videos, listening to music and playing some games. It feels durable and reliable, looks stylish and nice and comes with an affordable price tag. Very much recommended for anyone apart from gamers and power users.